As the war in Sri Lanka ended and a kind of normality slowly returns to the country, a number of novels have emerged exploring the war and its effects. Last year saw The Island of A Thousand Mirrors by Nayomi Munaweera (reviewed here). That book followed a family touched by the violence who choose to leave their country behind. In his debut novel, Australian author Rajith Savanadasa takes readers past that time, to the middle classes of the “new” Sri Lanka. But the war is never very far from the surface. 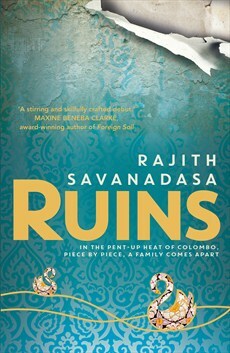 Savanadasa’s novel focusses on a middle class Sri Lankan family in Colombo. He starts from the point of view of their servant Latha and subsequent chapters are from the points of view of the younger teenage daughter Anoushka, newspaper editor father Mano, his wife Lakshmi and their elder son, and prospective venture capitalist, Niranjan. Each of these characters give a different perspective on the “new” Sri Lanka in which they live. Issues of class, government control, racism, the influence of the West against ancient traditions are aired from different generational and cultural perspectives. Each of the characters has their own arc and trajectory. Each is well drawn and while they all have their faults, Savanadasa has sympathy for each of them and their individual situation. The family all come together for a road trip in the middle of the novel to take Latha to the funeral of a nephew in a distant village. But other than that they all try to sort their issues out on their own while the resolution of each impinges on the other. Savanadasa skillfully keeps these threads going as the plot moves on, even while constantly shifting point of view. There is a deeper level still to Ruins. Savanadasa has based his narrative and his characters on an ancient artefact known as a ‘moonstone’. The moonstone has a lotus at its centre and concentric bands of animals and plants radiating out to its edge. There are a number of interpretations of what each of these animals might mean. In Ruins, each of the main characters is represented by one of the animals of the moonstone. While it is tempting to try and read backwards into the novel to see how Savanadasa has related these characters to a particular interpretation it might be better to see this novel as Savanadasa’s own interpretation of the moonstone and its applicability to modern Sri Lanka. Either way, Ruins is an accomplished and insightful debut. Savanadasa takes readers into the moral, ethical, social and economic quandaries of a country trying to rebuild and, in some respects, redefine itself following decades of conflict.